The stunning and varied Greatest Show on Earth by Gossamer Thread’s Vaudeville Co. was a huge success at the lovely St. George’s Theatre in Yarmouth. Compered on this occasion by Natalia Kalashnikov aka Velma Von Bon Bon, the vodka swigging force of nature that she is. She did a great job, guiding the crowd through the levels of applause and telling tales of her old times with Putin! The first act she introduced was the stunning Lost in Translation Circus with Duo Roma. This was a new routine and as beautifully brilliant as all the others I have seen in the past. Exquisite! Natalia then announced Alex the Mind Reader, fresh from a successful tour who chose a couple of ‘volunteers’ from the audience and very entertainingly Wowed the crowd. A good mix of humour and amazement, as always. Following on from Alex was the incredible Daisy Black on hoops, who also wowed the audience. The two of them together then returned to the stage after a short chat again with Natalia, for Carny and the Tramp, a lovely and impressive routine involving razor blades, broken glass and … the tango! During an interval for refreshments the stage was set up for one of my favourite moments of the night, the brilliantly conceived and delivered ‘Love Machines’ … a quite moving story of love between two automotons during their brief animation. After some more highly entertaining appearances by Alex and a hysterical piece on silks by Natalia, followed a song from the harmonious duo Below the String before the night closed with another of my favourite acts, ‘The Twins’ on aerial hoops, a truly stunning and beautifully choreographed routine. Between all the acts Natalia Kalashnikov was wonderful as compere and indeed as a performing artist too taking part in some incredible acts. The curtain call was accompanied by rousing cheering and clapping and a short rendition of Happy Birthday to a couple of the cast. A wonderful evening indeed. 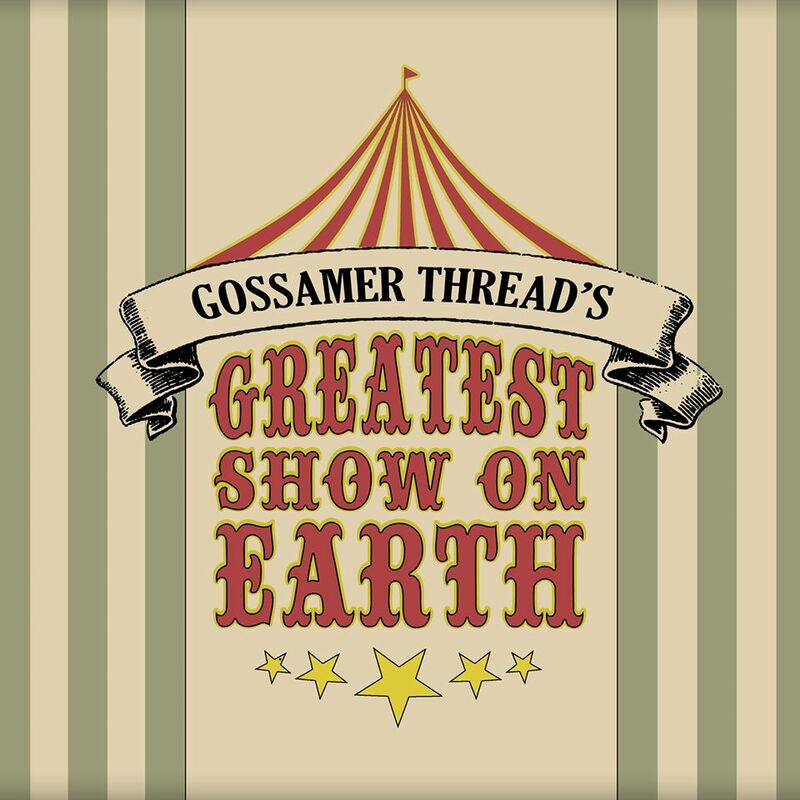 After a sell-out show at Norwich Arts Centre last year, Gossamer Thread’s GREATEST SHOW ON EARTH comes to St. George’s Theatre Great Yarmouth on 17th April 2015! The ringmaster’s been at the vodka, the automatons have come to life and the conjoined twins have fallen out… what could possibly go wrong??? Gossamer Thread’s Vaudeville Co. brings you a night of sawdust-scented vaudeville spectacle featuring some of the best international circus and cabaret acts around! Hosted by and featuring a brand new act from the vodka-drinking, cigar smoking Russian with a lust for danger Natalia Kalashnikov! Featuring Internationally acclaimed Lost in Translation Circus presenting their stunning Duo RoMa; Gossamer Thread’s favourite musical maestros Below the String; and from Gossamer Thread’s Vaudeville Co. Daisy Black, aerialist and hula hoop artist, and fresh from a nationwide tour, Alex the Mind Reader. The Norwich-based Gossamer Thread Vaudeville Co. were making a return visit to Yarmouth, this time appearing at the beautiful and far more suitable St. George’s Theatre. Last year they performed at Star’s Showbar, another great night at another lovely old building but one with some ill-considered interior design alterations by the venue, worst of all being chrome railings at the front of the stage. St. George’s however is everything one would expect and more, a proud building every inch a theatre with balconies, good acoustics, wonderful staff and a truly spectacular roof. A lovely venue to watch this brilliant high-calibre production which had such a sense of occasion and with really lovely staff and crew. 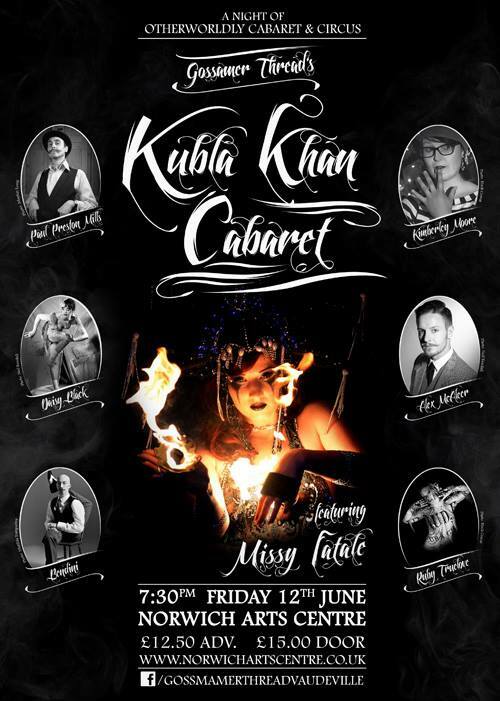 Their next show will be at their usual Norwich home of the Arts Centre on 12 June for the Kubla Khan Cabaret. After some farewells it was time for me to catch a train back to Norwich, negotiate a way past the hell that is Friday night clubland and back into the familar part of the city that houses the fabulous Bedfords Bar and Crypt. Playing in the Crypt tonight, and for the sixth and last time, were the Wayward Natives crew. The place was as deservedly rammed as I have ever seen it making it not only tropical in name but also in heat and humidity with great music ranging from Afrobeat, Funk, Dub, Highlife, Ethio-jazz, Calypso and latin and the smiles in abundance reflected the lovely and good-natured atmosphere. It was the first birthday for Wayward Natives and their sixth night here, I may possibly have been to all of them albeit arriving late in the evening on most occasions. Tonight the place was packed from 10pm right up until the close at 2am and the dancefloor never stopped moving. It’s a great thing these guys have created, I hope it will revive in some form at some point. Where else can you find such high life and pineapples all year round and a mad dash to dance from those outside and upstairs when they hear the opening strains of a track by Fela Kuti?! Meanwhile, the upstairs bar at Bedfords was also packed. Great things are happening here and it has become a real draw with improvements being made all the time, the owner Glen adding pieces here and there, though sadly one of the lamps he added was pinched during the weekend, he is looking for information and has stills from the security camera here. Many thanks to Alex and Daisy from Gossamer Thread, all the cast and crew of the Greatest Show on Earth as well as all at St. George’s Theatre. Thanks also to the amazing Wayward Natives and exceptionally good people at Bedfords Bar. This entry was posted in Gossamer Thread's Vaudeville Co., live music and dance and tagged Aerial hoops, Alex the Mind Reader, below the string, cabaret, daisy black, gossamer thread's vaudeville co., Great Yarmouth, Greatest Show on Earth, Lost in Translation Circus, Natalia Kalashnikov, Silks, St. George's Theatre, Velma Von Bon Bon. Bookmark the permalink.